After spending a couple of days in Harbin, one of the coldest cities in China, I decided to go to Sanya for Spring Festival this year. 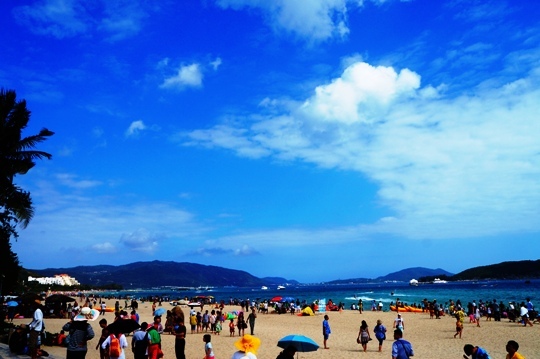 Sanya is a noted tourist destinations particularly for Northern Chinese and Russians to escape freezing weather. The favorable climate is hot in summer but warm in other seasons attracting many followers. It is considered as China’s Hawaii. Sounds great, but one problem: it’s extremely expensive during the holiday. I’ve heard a lot about how expensive and crowded Sanya is during Chinese New Year. I’m well prepared. Ideally I would love to stay in a 4-5 star hotel with private beach which only costs 500 to 1,000 RMB (US$ 80-100) per night on off-peak dates. But during the holiday, the price was climbed to 5,000 RMB (US$ 804) per night. Unbelievable. No wonder a lot of Chinese people would rather spend Spring Festival in Thailand or other Southeast Asian countries. Even though it’s over priced, I’m just curious about Sanya. It’s China’s Hawaii after all. Whether it’s good or bad, I have to see it with my own eye. 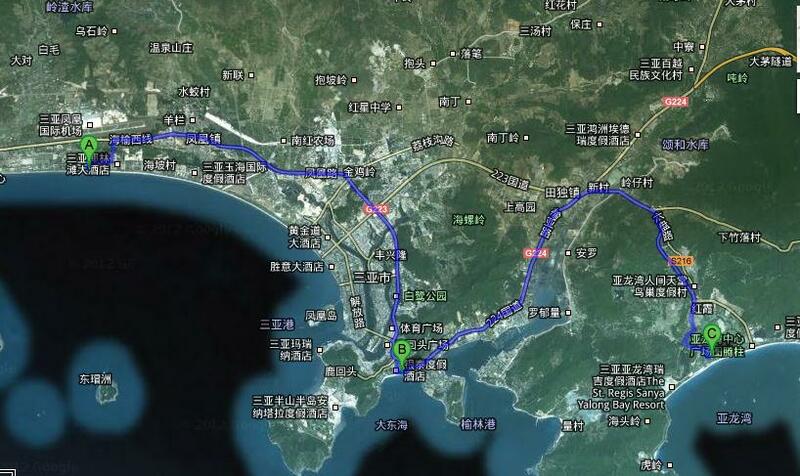 There are three major bays (or districts) in Sanya. From least expensive to most expensive: Sanya Bay, DaDongHai and Yalong Bay (A-B-C). This is where I stayed in Sanya for the entire week. Most tourists don’t like to stay here due to its relatively coarse sand and polluted sea compared with the other two bays. But I had a good time here. There are certainly less tourists in Sanya Bay. Food and hotels are cheaper though the facilities and service are not that satisfactory. 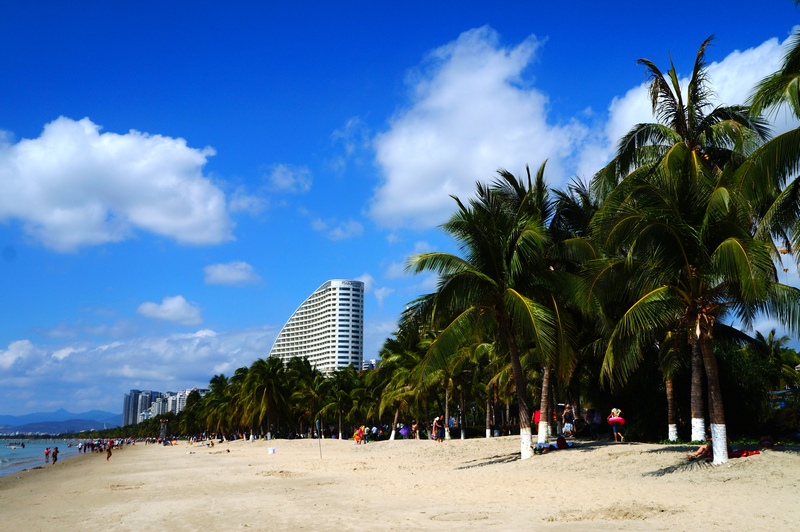 I walked the whole 2.5-km-long Coconut Tree Dream Corridor which is a famous seaside avenue built along Sanya Bay. It’s only 20-minute bus ride from the airport. I went to pretty much everywhere by bus from Sanya Bay. The most romantic time to view the Coconut Tree Dream Corridor is at the sunset, when red dusk clouds are all over the sky. I was waiting for the sunset on the 11th floor of a café called The Bud. 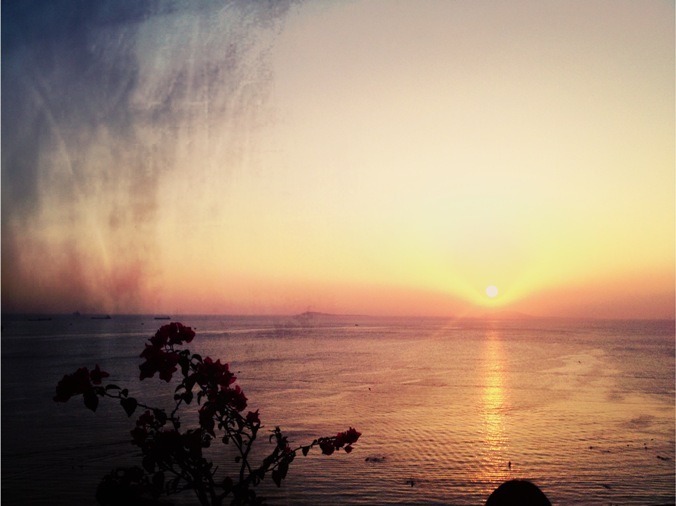 It’s the first café in China where you can enjoy the breathtaking sunset. It is definitely the most beautiful memories of this trip. I also enjoyed dancing with the locals along the beach in the evenings. This is something you can’t see if you stay in the other two bays. The city is full of life. Local residents indeed know how to enjoy life and the beach just makes their life more romantic and relaxing. They gather together in the seaside garden dancing and singing after dinner. I think the fun part of travelling is to experience local life and do things I don’t do when I’m in Shanghai. I just couldn’t help but join the dancing crowds! 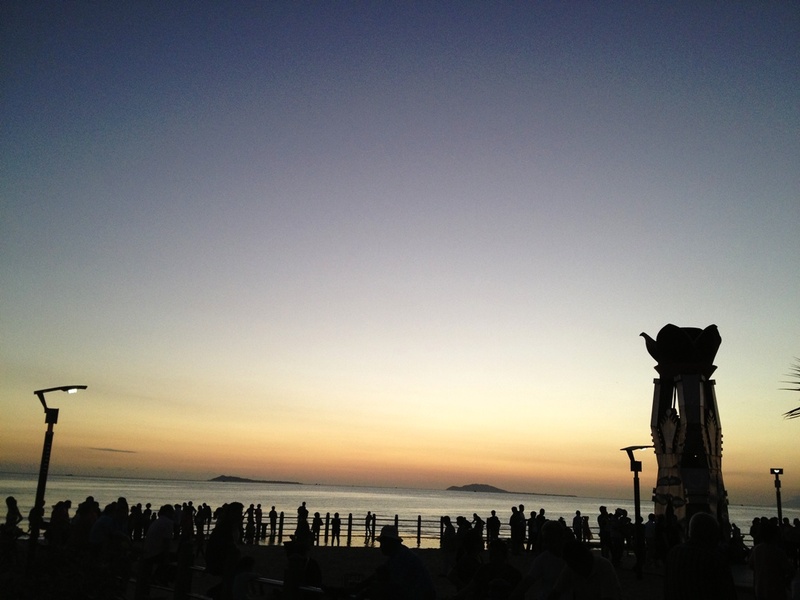 DaDongHai has Sanya’s best balance between development and natural beauty. 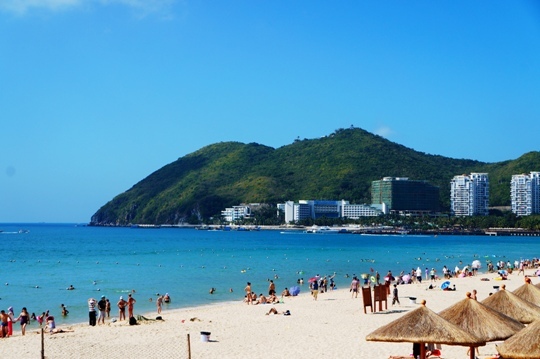 The town behind DaDongHai is more expensive than Sanya Downtown, but the sand is whiter and finer, and the water is warmer and cleaner which is gorgeous and excellent for swimming, diving, sunbath and other on-water amusements. Shopping and dining, however, are not as good as that in Sanya downtown and I had to eat Pizza Hut, which I don’t really eat in Shanghai for lunch because I couldn’t find any other nicer options. The local food really disappointed me, no matter its noodles or chickens. Most of the time, I had to have northeastern food and western food. Luckily, right before I went back to Sanya Bay, I found a little outdoor restaurant 20-min walk from the beach in DaDongHai. It’s owned by a young couple from Northeast China. They came to Sanya two years ago and realized there was hardly any nice place to eat near DaDongHai district. So they quit their jobs back home and moved to DaDongHai to start their own business. See, I’m not the only one complaining about the food there! I love their Sanya Salad and the super crisp pizza! This is the bay where all the major international 5-star hotels are located. The beach in YalongBay is bigger than DaDongHai. It’s completely separated from the rest of the city (20-30 minutes from downtown and 40-50 minutes from the airport by taxi). I went there and I did not enjoy it at all! The beach is flooded with tourists and besides all those 5-star resorts, there’s really nothing much. I had lunch at Pizza Hut (AGAIN!) at an artificial square. There is no supermarket, no shops, and no nothing besides fancy hotels. I suggest if you want to stay in Yalong Bay, just stay in your room and the private beach. It’s so difficult to get taxi in Sanya even from 5-star hotels. I couldn’t grab a taxi even once. What a great choice to stay in downtown! Sanya did disappoint me in many ways and I don’t think I will go there again for vacation. Tourists are constantly ripped off by local vendors; local food is so terrible that I didn’t want to taste for a second time; taxis are so difficult to get and even you are luck enough to get one, the drivers will take other passengers in halfway and still charge you full price. There are a lot for government to do to improve the tourist environment, otherwise I believe more and more Chinese people will choose Thailand over Sanya in the future. However, this trip had its highlights. It’s the first time I visited a tropical city in China and I was very excited that I got to walk on the beach everyday during my stay. My hotel was just located across the beach on Sanya Bay. The local life style at night was relaxing and healthy which was exactly what I needed after a year-long hard work! A journey of a thousand miles begins with single step.